HP’s new Chromebook 14 didn’t have to do much to impress me. Most other Chromebooks are small, cheaply made machines with underwhelming specs, including measly 11-inch displays. The one exception, of course, is Google’s gorgeous Chromebook Pixel, which almost no one can afford. The Chromebook 14 is affordable (if not super cheap) at $300, and it has a 14-inch display. It seems not to suffer from the AC-adapter overheating that halted sales of its cousin, the Chromebook 11 (an unfortunate turn of events, because that’s a nice little machine). I understand why most Chromebooks are taking the low road to attract student and casual home users, but the Chromebook 14 is a reasonable middle ground that makes for a much better user experience. There’s no way you’ll mistake the Chromebook 14 for its predecessor, the HP Pavilion 14 Chromebook, which debuted earlier this year. That Chromebook came in just one color--black--and aside from its large display, it felt pretty cheeseball, with a lot of hard plastics and a clackety feel. (PCWorld did not review this model, but I bought one for a family member and have used it extensively). The half-size cursor and function keys are smaller than we'd like. The Chromebook 14 offers three cheery color choices: peach coral (a bright, silghtly orangey red), snow white, and our eval unit’s ocean turquoise. The color covers the outer surfaces and the display bezel. The colored plastic’s slightly soft feel is nice, though it seems to hold greasy fingerprints easily (and we weren’t bingeing on potato chips while reviewing this product). The unit weighs a little over 4 pounds, and the AC adapter weighs another 0.7 pounds. The keyboard panel is silvery plastic. The island-style keys are hard, white plastic, but they have a decent travel and do not make the rattly sound that really bugs me on most other Chromebooks (including the Pavilion 14). Given all the room on this panel, it’s somewhat disappointing that the top function keys and cursor keys are half-size, although that does leave lots of room for a large (and responsive) touchpad. Connectivity on this model is notable for having two USB 3.0 ports as well as one USB 2.0 port. You get 802.11a/b/g/n Wi-Fi and Bluetooth. There’s also an HDMI port for attaching an external display, and a slot for Secure Digital media. Dual stereo speakers provide adequate sound. A combination headphone and microphone port and an HD webcam finish out the accessories. 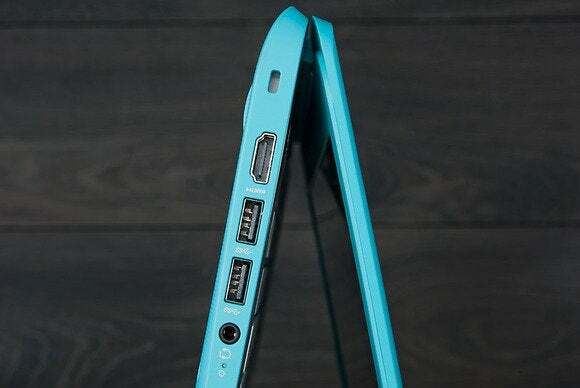 The ports include two USB 3.0 and one HDMI for external displays. The display is nothing special, delivering resolution of 1366 by 768 pixels (the same as you’ll find on many 11-inch Chromebooks). It has little in the way of vertical viewing angles, but the side viewing angles are pretty good. A buddy could watch a movie with you on this screen without too much trouble. The display’s shiny glass is potentially a problem, though. It catches a lot of glare and reflection, especially in a bright room. The Chromebook 14 performed well in standard activities like streaming a movie (which also depends upon your connection quality, of course). It’s powered by a 1.4GHz, dual-core, Intel Celeron 2955U with Intel HD Graphics and 2GB of DDR3/1600 RAM. I saw no hiccup or lag in my experience. A 16 GB SATA SSD provides a nice dollop of on-board storage, plus you get 100GB Google cloud storage free for two years. Battery life was good at nearly 7 hours, though not as close as we’d like to the 9 hours HP specified. HP’s Chromebook 14 does most of the competition one better, just because of its larger display. Maybe you’d weep a little more if your kid destroyed this model rather than one of the cheapies, but anyone who enjoys the Chrome ecosystem will appreciate the better user experience this model provides. This Chromebook comes with a 14-inch display and cheery colors, making for a better overall user experience than you'll get from cheaper models.